It's National Chicken Wing Day!!! Cook up some saucy, fiery, finger lickin' tasty wings! In a large frying pan over medium-high heat, add the oil and allow the oil to get hot. Add the dried chilies, garlic and ginger, quickly stir frying so they it doesn’t burn. Continue to cook while stirring for another minute or two. This allows the chilies to release its heat and infuse into the oil along with the fragrance of the garlic and ginger. Carefully add the chicken wings in the pan in one layer and turn the heat back up to high, allow the chicken to brown and turn as needed to brown the wings all over. This will take approximately 10-14 minutes. Add the coke, soy sauce, hot chili soy paste, sugar and water. Stir to completely dissolve the sugar. Allow the sauce to come to a boil then turn heat down to medium and allow the sauce to simmer. Cover and allow the chicken to cook for another 10-15 minutes, turning them occasionally to ensure that all sides are covered in the sauce and absorbing all the flavors. Cooking time will vary if you are cooking just wings versus drumettes. In a small bowl, add the cornstarch and cold water and make a slurry, stir until the cornstarch is completely dissolved. Add the slurry into the pan and stir, turn up heat to medium-high and allow mixture to come to a boil and thicken. 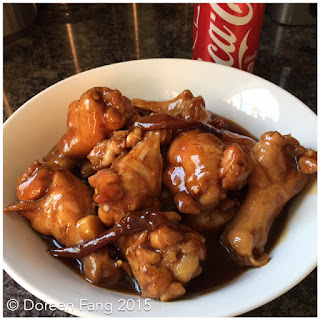 Cook for an additional 5-10 minutes, stirring occasionally and turning chicken wings. Once the wings are completely cooked and sauce is thickened, remove and serve. This is my spiced up version of my mom’s soy sauce chicken which was one of my favorite dishes growing up. And a little hint…this dish is EXCELLENT over rice to absorb all the rich, spicy sauce, that’s why there is so much sauce. Spice it up for National Tequila Day!